Configure the sheet metal part you need in 20 seconds and get the price for 14 different shapes online. We have worked hard to make it as easy as possible for you to order a individually configured sheet metal part. Enter the measurements you need and click on calculate to get YOUR price. 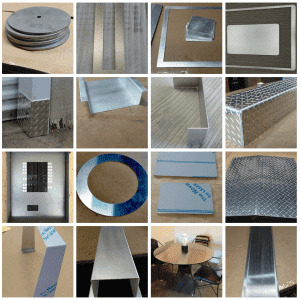 Sheet metal shapes are: rectangle, circle, divided circle, different triangles, ring, frame, angle or corner guard, U Channel or J Channel, Box or Tray, Hat Channel, Rectangle with centered hole, Z Channel. All custom made and made to order for you.